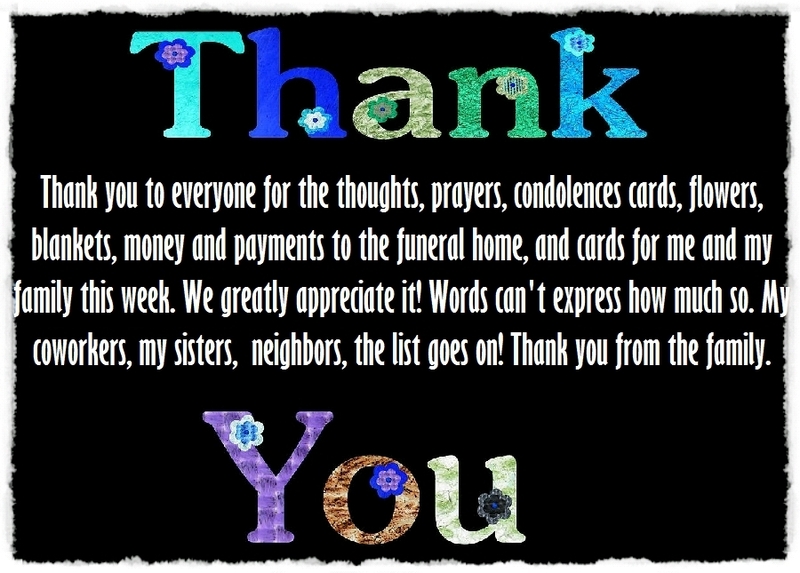 Writing thank you notes or appreciation messages after a funeral is so important because attending a funeral means you are showing your sympathy and condolences toward suffering family. In return we can't say enough thank you words and sometimes not find the proper words to convey how great and comfortable they have made us feel. You can customize your own sympathy thank you notes by printing these sample messages and poems on it or you can simply post these verses on your Facebook timeline. 1- My father’s funeral services today made me a very proud son! I have a wonderful peace and a new understanding of this page of life. It does not feel like an end but a beginning. I would like to thank each and every one of you that came to show your respects! You all are truly the best of the best! 2- A huge heartfelt thank you to all that attended my mom's funeral today and for all the lovely messages from those you couldn't make it. Today was a perfect goodbye! The night is still young! RIP mom. 3- Today we are having the funeral for my sister, we will all miss her. Thank you for purchasing the flowers for your auntie. Thank you, sweetheart, the Lord will bless you abundantly. My sister and I put all the flowers arrangements together. Very thankful for everything! 4- Thank you to my daughter’s dearest friend for sending me these beautiful flowers because it's been a rough week of a funeral. Thank you for your kind heart for thinking of me. My Heather loves you dearly and thank you for loving her and being the best friend to her. We are so blessed. Again, thank you. 5- As some of you know, my dad passed away yesterday. This has got to be one of the hardest things I have ever done in my life, planning his funeral. I haven't got the exact times of the temple ceremonies as of yet but I will keep everyone posted. Please help me spread the word to your parents, aunts, uncles, and eve brothers and sisters that have not known so far. Tag some people if you have too. Thank you and I will give you guy’s updates as I get them. 6- I would like to thank everyone for the fantastic support and condolences notes that myself and family have received in this very sad and hard time. I would also like to let anyone who would like to attend dad’s funeral service to pay respects. 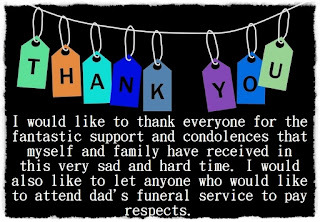 7- Thank you to all who came to the visitation, the funeral, sent flowers, goodbye speeches, sent emails and texts and made phone calls to me in the last week just to check up on me. You are all dear friends! Today was difficult for me and my family to say our last goodbyes to grandma even though we know we will see her again in heaven someday. It has been fun being with family, going through old pictures, remembering stories of our childhood, and sharing memories of a wonderful woman who shared with us how to live a life full of love. I will lay my head to sleep tonight remembering this blessing that was spoken at her graveside: May the Lord bless you and keep you; may the Lord blessings shine on you and are gracious to you; we love you grandma, you will be missed. 8- I would like to thank those of you that paid your respects to our sister by visiting her in the hospital ,looking after us at the hospital during her final days, after the passing away, attending the funeral service, offering the support during her 15 days of prayers. All your contributions meant so much to us. 9- Thanks to everyone who showed up to our daughter’s funeral. She looked so peaceful. I'm happy for all the support we received. It means a lot to us. Thank you, mom and dad, for all your help, we couldn't have done it without you both and my sisters. Thank you all, I really wanted her laid to rest and not cremated. No matter the cost. Now we have a beautiful area to visit her whenever we want. 10- Beautiful flowers, friends, and memories the last few days. Dad's Celebration of life was extemporaneous but so wonderful that it seemed scripted. There was a fabulous celebrant and had one of the best quotes of the day: "These people make you sorry that it's not appropriate to applaud at a funeral." I'm not going to try to identify everyone, but you were amazing and we'll never be able to thank you, and the scores of people who paid their respects, enough. Just wish I had gotten a photo of some of the visitors who wore their coveralls in tribute to dad. They are a supremely talented and special group of men and were incredibly kind to honor that way. Thank you, one and all. 11- I can't thank you to all enough who made it to my Dad's funeral today... and especially to those who couldn't. What a great day of honoring him and what a mind blowing comforts to all who have been left in his awesome wake. The strength of love shown by everybody has been staggering and I am honored to be called his son. RIP Dad. Love you to bits, although you'd hate me declaring that in public! I will miss you forever. 12- I just want to thank you to everybody that attended my dad's funeral today it really was a great send off for such an amazing man, I can't believe how many people turned up just shows that he influenced so many people's lives. You will never be forgotten. 13- Thank you so much to everyone who came to my dad’s funeral yesterday. It was a wonderful send off for a wonderful man. He would have been so pleased looking down seeing all his family and friends celebrating his life. Thank you all again! My Grandma is so beautiful! Thank you for the ones who came to the funeral and the ones who couldn't make it, all love. God Bless all of y'all. 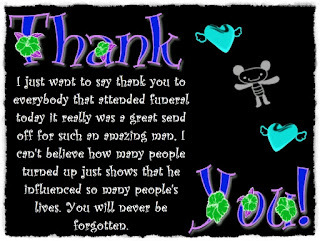 Thank you for attending and singing at my Grandpa funeral! Now every time I hear that song I am filled with happiness thinking of our dear Grandpa Al and all his wonderful songs, poems and stories and how you never saw him without a smile on his face. He sang and danced and loved life and the people around him till the very end. I want to be like him. 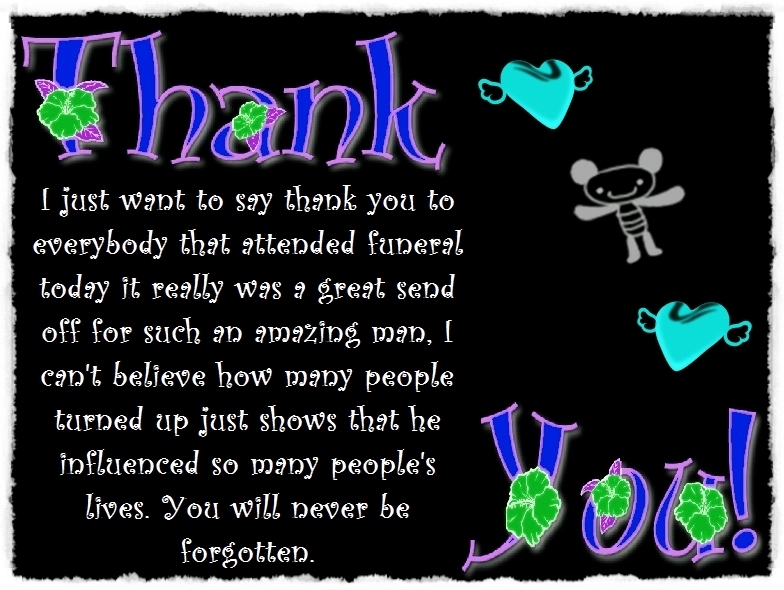 To the good people at my mother funeral Home! We would like to thank you guys for the terrific job y'all did with my mother's preparations. I must say that I felt better knowing that my mother was in good hands and being treated properly. 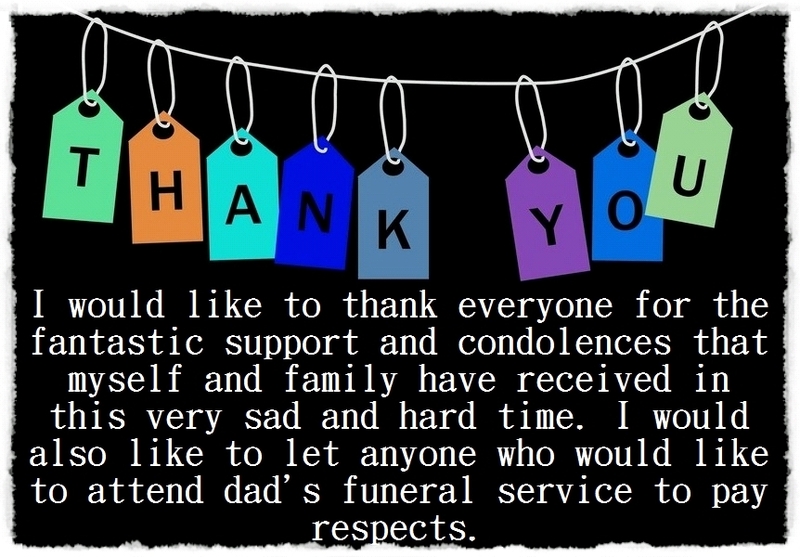 The family of my aunt would like to thank those who came to pay respect at her funeral and benefit. Thank you also to all those who donated to the cause! We greatly appreciate all of you, thank you all from the bottom of my heart. I wanted to thank all of our family and friends who supported us in one way or another regarding my dad's unexpected passing. Thank you to everyone who was able to come to his wake and funeral. Thank you for the food, cards, help, verses, and prayers. They mean so much to us all. We feel so blessed by all of you wonderful people. It is a difficult transition but God is good. I cannot state how much my family and I be thankful for all of you that have commented, texted, called, cards, sent food, flowers and much more over the last few days. This is a true testimony to my brother and his mark on this world. We are blessed to know and love you all. We will lay him to rest today in his funeral; there is nothing more fitting for this man. Thank you all again and God Bless you all. Thank you for all of your love, prayers, funeral donations, support for my family and I at this very emotional time. My Grandmother was a beautiful soul who told the best stories and cooked like nobody's business. Both my Ancients are fighters and are a treasure full of wisdom. Warriors are not born they are made through trials and challenges , I swear my prehistoric have been around probably since the dawn of time which is most likely why we all turned out as good as we have . Thank you ancients, Thank you to the wonderful original rebel who started it all. I know you are still playing pranks and feeding people in heaven and one day I know we will be sitting together again with you making my banana curls and giving me mischievous ideas how to scare out of someone. I love you, Grandma, I was more than blessed to be with you at the end of your journey. We all will miss you more than you know. It was a beautiful funeral. I want to thank you all for your prayers and support, you guys are awesome and I have faith your event years to come! Our community came together like never before for this family. God willing, we look forward to seeing you next year as many if not more your way next year. Thank you to everyone who attended the funeral service of my late sister in law and also for your messages of sympathy and for your floral tributes. Special thanks go to her friends and her senior citizen group who went all out to give her a good send off. We appreciate each and every one of you. May God bless you all! Thanking you for being there at the biggest funeral and showing your respect and love for my late brother. I am deeply humbled and grateful for your presence in the funeral, your donations, food, prayers, goodbye song and the support you provided me and my family in this hard time. Thank you, you are highly appreciated. I would like to extend my heartfelt gratitude to all my friends, relatives and all who knows us for being with us during the death and wake of my youngest brother and to those who attends the prayers and funeral, thank you very much for the love. I will never forget you and worth remembering. 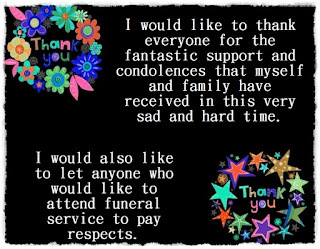 Three short but inspirational funeral thank you card poems, these verses are written in for general purpose, you can edit it according to your needs. 1. 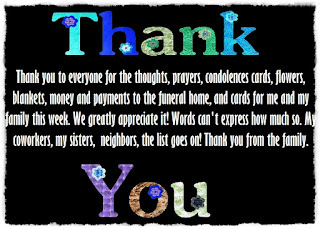 Thank you to everyone for the thoughts, prayers, condolences cards, flowers, blankets, money and payments to the funeral home, and cards for me and my family this week. We greatly appreciate it! Words can't express how much so. My coworkers, my sisters, dad's neighbors, all the churches, the list goes on! Thank you from the family. 2. My thoughts for this day, I am blessed to be liked by my staff, and my coworkers. I have a lot of friends on Facebook of whom all see me and complain. But I have to say one thing. Thank you all for everything. You have made my life by attending my dad funeral, it’s worth living because if it wasn't for you all I don't know what I would have done. 3. Many of my friends and coworkers have asked if there is anything they can do for me and my family during this very difficult time of losing my daddy. I would like each of you to consider contacting Funeral Home and donating to the cremation cost. You could do it in honor of my daddy; he was a meek soul who I had the privilege to know for many years. Daddy would never let anyone do without and would have been the first money in any donation plate for the needs of other people. Knowing the need of his family has truly allowed me to see how blessed and loved we have been in our darkest moment compared to those who have no resources or support while dealing with and going through the same tragedy. He is deserving of being laid to rest properly and it would mean the world to me if you would consider my request. Thank You. 4. I want to send a shout out to my work family. They sent me the most beautiful roses to the funeral and then today we received this amazing bench from them. It means so much to me to have such a great relationship with all my coworkers. Thank you again, crew, you’re the best. 5. Thank you, everyone, for the enormous amount of love and support you have given our family in this rough time. The funeral will be on Thursday. Visitation will be from 3-7 and the service will follow immediately after. We are asking you to spread the word to help make his day of celebration one he would be proud of. Thank you. 6. I would like to thank everyone for their continuous support and prayers my family and I truly appreciate it. I'm writing this post to see if anyone it could friends, family or co-worker have any pictures of my mother. If you do and you don't mind can you please send it to my Facebook account? 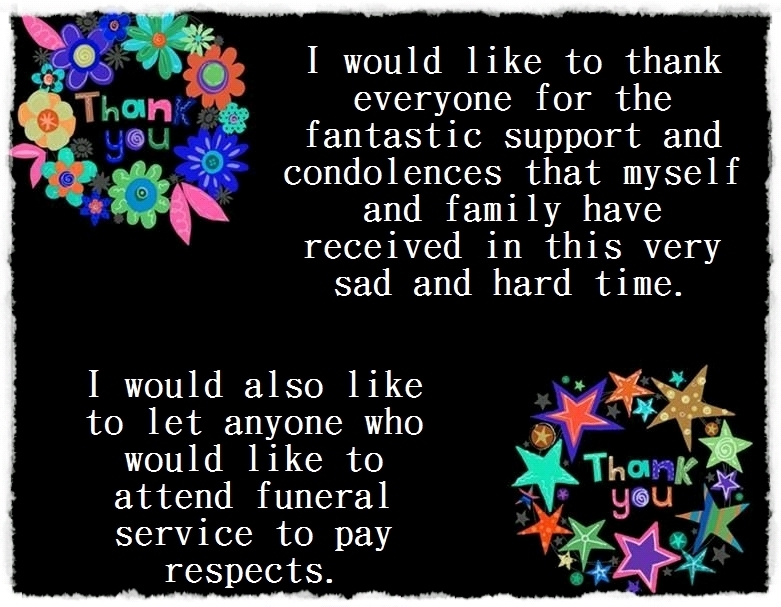 Thank you so much and tomorrow I will have all the information about the wake and the funeral posted. Again thank you in advance. 7. I just want to thank everyone for all of their kind words and thoughts and prayers over the last few days! I can't thank you all enough. I'm also so blessed with the best coworkers a girl could ever ask for. We will be traveling down for the funeral on Sunday. Love you all. 8. I would like to give you all a heartfelt thank you to my awesome coworkers for the beautiful flowers that were delivering to me when I came back from my sister's funeral. They are beautiful flowers. You guys are the best coworkers ever. 9. I want to personally thank all of my coworkers , brothers and their old ladies for giving my family so much comfort letting us know how you felt about the man I loved that you felt like me. My brother loved everyone he met and they were like family to me and my family. I want to thank again each of you. 10. I want to thank everyone that has reached out even though we may have not responded. Your thoughts are with us, for all of you that were asking and concerned were having an intimate family gathering at funeral home.